Although this sounds like a Grand Tour it wasn’t really, being a continuation of the snapping up of unconsidered trifles in Germany, together with some more loose ends in a variety of other countries - even including the UK! 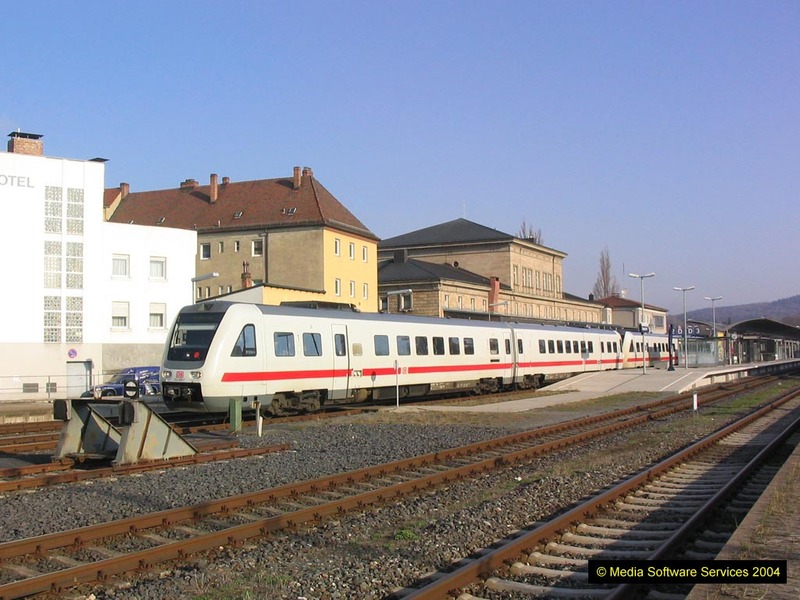 The pegs on which it hung were the annual passenger services from Dillingen (Saar) to Bouzonville for the Good Friday market (narrowly missed on a previous visit to Saarland), and some engineering diversions using the Gemünden avoider. Though not travelling on a Friday, I feel I must report victory over the Shakespeare in the final quiz of the season last week! Off in fact on 1715 Telford-Wolverhampton which arrived at Wolverhampton 5 late but in plenty of time for a pint of Golden Glow in the Great Western before the 1819 to Euston. [You might well think this is evidence of beer desperation. It isn’t. It’s evidence that I was booked on a specific train to Euston, and such is the appalling ‘reliability’ of the ‘service’ from Telford that you always have to go for the train before the one you want, to have some hope that one or the other will turn up. Such is the modern railway.] This was a loco-shoved set, comfortable by Voyager standards but in deplorable condition. It was however sufficiently early into Euston (booked 2031, arrived 2020) that I made the 2047 from Waterloo East with comparative ease - well, 55 seconds anyway. The normal sedate trundle out to Fawkham, followed by what seemed an alarmingly long coast as we swapped from third rail to overhead. Once done, there were suitable Eurostar acceleration effects and a fast run down the CTRL to a stop at Ashford. It looks as if you need to do an up stopping service but either way over the flyover should suffice. Could be wrong though - layout to be checked! I wasn’t quite clear where the end of UK track was [meaning track in the UK I hadn’t done, not track immediately preceding the UK/FR border] - went round the north side of Dollands Moor so that at least must have been new. Out into glorious sunshine at Coquelles but there were some fearsome showers in view! Having happily believed for years that all E*’s stop at Lille I was pretty amazed when we hurtled through at what seemed like a good 70 mph. As I write we’re just going round the east side of the LGV triangle with 30 minutes to go if we’re to reach Brussels on time. Hmm… I’ve so far had three text messages from Orange France and the novelty’s wearing a bit thin. And no sooner have I written that, than Orange welcomes me to Belgium where Mobistar… blah, blah. In fact reached Brussel-Zuid exactly on time. I’d made the long trek down the train, arriving at the front somewhere near Forest yard, but there was no immigration check so I was easily able to get singles Arlon - Luxembourg and Aachen Süd - Welkenraedt (for next week’s return) and still make 1136 to Luxembourg armed with a bottle of Westmalle Tripel from the supermarket. Very nice it was too. 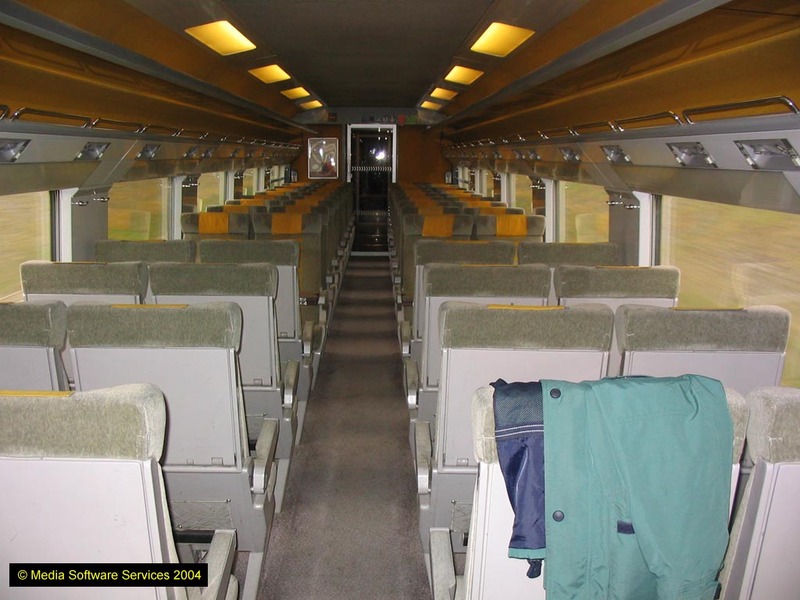 The train was one of the nice new karts with proper (cloth) seats and air con (class 41? ); a vast improvement on the beastly ‘Break’ units which have worked the Luxembourgs for some years. I sat peaceably trying to work out the electronic signs which seemed to tell me I was in the wrong portion (Arlon only) and when the grippeuse came round she confirmed this, so I pottered down to the Luxembourg portion between Namur and Ciney. No track to Luxembourg of course, but the kart made up for this with numerous crossovers due to wrong line working. This seems to be a bit of an Ardennais speciality, goodness knows why. Very noticeable that since Belgian trains are now all non-smoking local practice is to use the loos as smoking compartments - quite amazingly irritating for those wanting them for their intended purpose, as they are occupé all the time! On arrival at Luxembourg around 5 late, much ticket buying (day rover, Rodange-Longwy return and Wasserbillig-Trier) then a look at the timetable which seemed to offer a chance to get to Volmerange and back (lucky I caught 1136 ex Brussels not 1236 - it’s sometimes sensible to stay out of the pub!). To my delight the next train to Bettembourg was ‘croc’ 3609 plus four ancient CFL coaches [well, they would hardly have been anyone else’s]. Excellent. 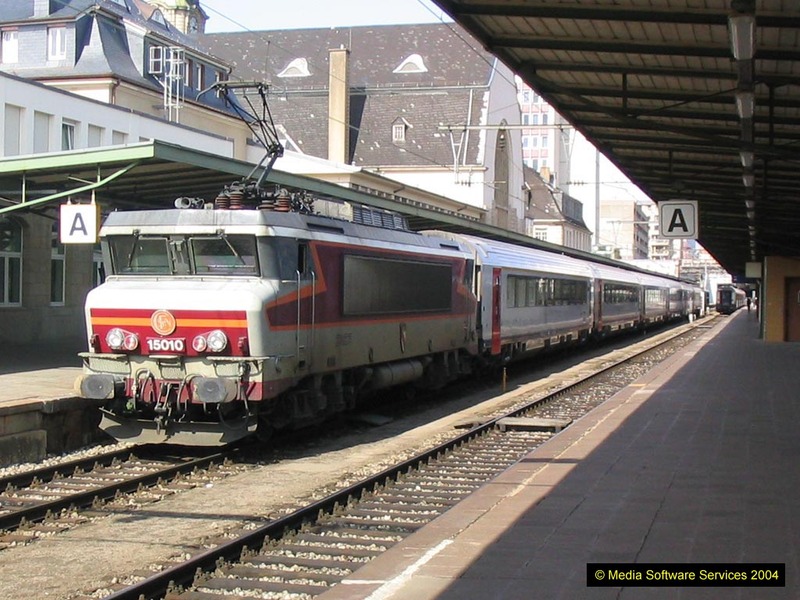 At Bettembourg there was a 2 minute connection for a 1975 Paris-built EMU to Volmerange. Highly satisfactory provided I can get back! The extension to Volmerange-les-Mines is very short, basically just the length of the factories at Dudelange-Usines. However it’s in France (partly) so it’s not only track, but cross border track! Volmerange has an island platform, with plain track one side and no track the other. The line obviously went further but it’s been covered over by the road approach to the station and seemingly this is as far as they’re going. It also appears to be a purely CFL operation so presumably my day rover is valid. 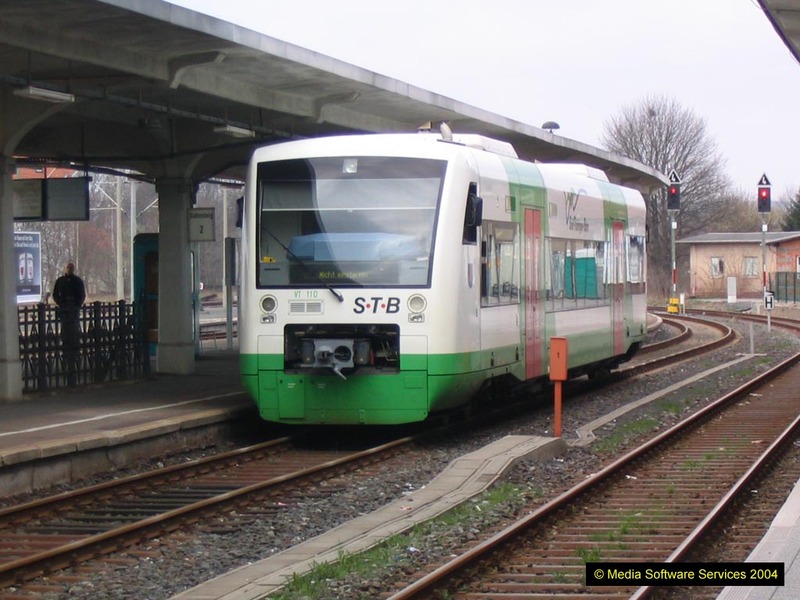 Also noted - the Dudelange factory system runs parallel to the passenger line almost all the way (terminates just short) but the last physical connection south of Dudelange-Usines is only a few metres from the platforms. Although I was the only passenger Volmerange - D-U, the train was busy thereafter. Going out, about 6 went D-U - Volmerange. In the event the return working at 1612 ran through to Luxembourg so I was in good time for 1709 to Longwy, more ‘Mk 1s’ this time hauled by new electric 3013. 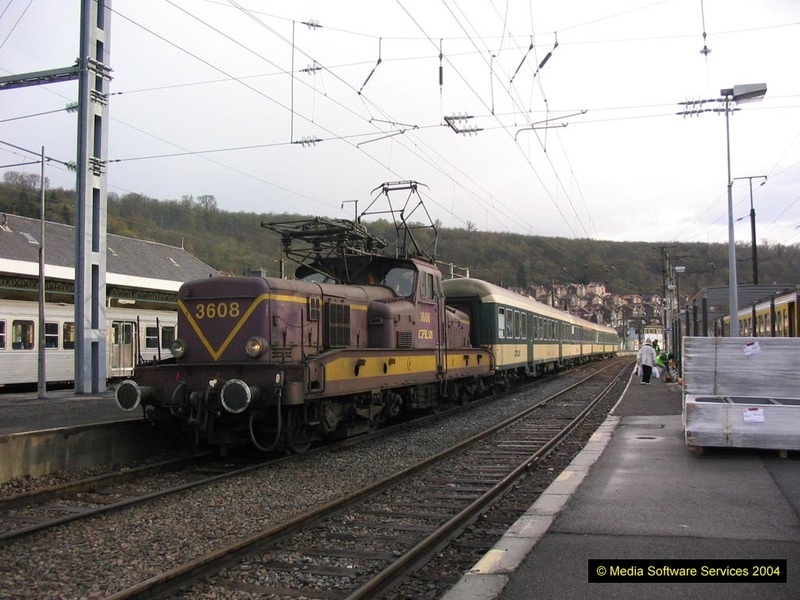 The run out to Longwy (my last Luxembourgeois passenger track) featured heavy rain in places, but did the business with perhaps 20 passengers continuing beyond Longwy. Longwy was a bit bigger than I had feared and was ‘blessed’ with a pub near the station to which I repaired for a celebratory Kronenbourg, if there is such a thing. I’m still hoping for a dry walk to the hotel at Trier. On return to Luxembourg I had 40 minutes so grabbed a McDs to facilitate an earlier night in Trier. The RE to Trier turned out to be (I hope - it hasn’t gone yet) the stock from a Norddeich/Emden Aussenhafen to Luxembourg IC, powered by a 181. Pretty good compared to the kart from Longwy! On arrival at Trier [it was the stock off the IC] it was dry as hoped for and I trotted happily along to the hotel only to find another reservation failure (see Am Bahnhof 27.3.04). Not so good this time as they wouldn’t co-operate [possibly couldn’t, certainly wouldn’t] and reception shut at 2135, not what HRS had advised. I retired hurt, intending to find a hotel near the station but encountered the Hotel Aulmann just round the corner. Friendly English speaking receptionist (closed 2200 so just in time) and a very smart room for a reasonable, under the circs, €58. Disaster averted. Large crowds awaited at Siersburg and a small one at Hemmersdorf - still a handful of seats left in the front set but all the same it looks a nice little earner for DB. It turned out to be a very picturesque run ‘over the top’ though Bouzonville itself didn’t look too inspiring at least near the railway. The [annual Good Friday street] market was on a large scale as far as I could see (couldn’t get through the crowds to find out, and I didn’t want to risk missing the return) but full of the usual suspects selling the usual tat. Goodness knows why it’s so popular. It did however have a beer stall - under the circs (cross border freight line to be celebrated) I switched off Puritan mode despite it being 0945 and had an inspiring (!) Heineken at a mere £2.40/pint. The glass came with more lipstick than I’ve ever seen in one place so I requested a swap. The barman was quite obliging about it, for a Frenchman. On the return the Sonderzüg obliged me by being a minute early, and the 1033 to Saarbrücken two minutes late, so it was just running in as I staggered on to P5 gasping for air (it being a -1 minute connection). Connoisseurs of industrial grot shouldn’t ignore Völklingen, whose steelworks and power station contribute much to the general ambience. A few minutes at Saarbrücken gave me just sufficient time to grab a can of beer (handy for keeping the seat next to you empty!) and check for earlier connections from Homburg to Mannheim, of which more anon, before joining a 628 for the scenic (in a coal tip sort of way) run to Gennweiler. In fact as this track had been done in rather dubious daylight last time it was worth a repeat, tips and all. The new curve diverges left just after Merchweiler tunnel. It has bases for OHLE masts in place but is not currently wired. The new curve and the one from Wemmetsweiler are both single; after the junction the line remains single for a couple of hundred metres then becomes double. Only the right hand (looking towards Lebach) line is electrified but the left hand one has mast bases. At the new station at Gennweiler the north eastern platform (40, obviously) is used by all services to Lebach and by the electric services to Homburg. The south western platform (50) is used only by the diesel services to Saarbrücken. 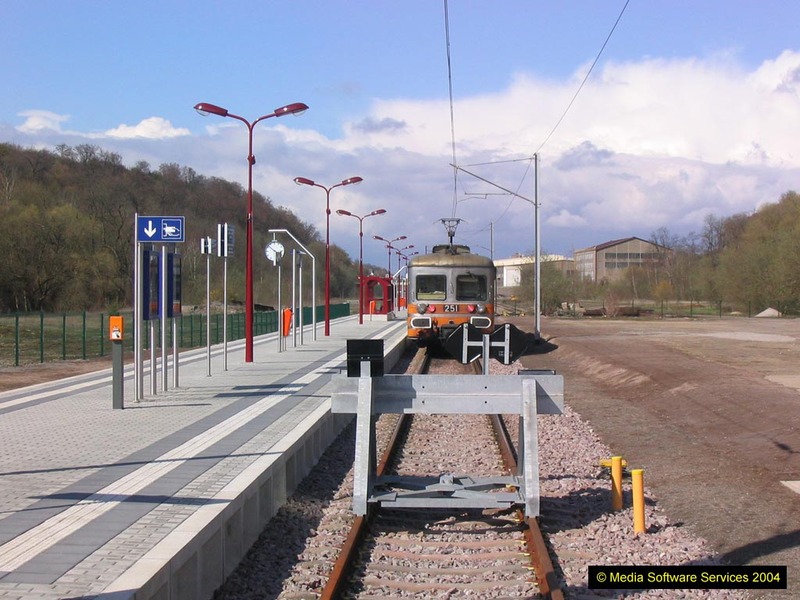 This may change when electrification is completed, although it provides a useful same platform connection for passengers from Saarbrücken to Wemmetsweiler and Neunkirchen (while confusing them, of course). The relatively comfortable LHCS on the Homburg services has been replaced by the wretched 426s with their mediaeval seating and ox-cart ride. Decided to get the 1227 RE to Kaiserslautern on the basis that if EC37 was seriously out of sorts I could still get to Mannheim in time by S-Bahn. The RE was a 425, unfortunately. Stuck at Kaiserslautern, surely one of the most uncongenial stations on the network, I wondered at the wisdom of all this, since the S-Bahn went (without me) long before I could find out if EC57 was out of sorts. The Markt im Bahn did at least provide me with a very nice sarnie (once the gherkins were removed) but the bar was too soulless even for me and there were no carryouts. Alas, the deterrent (see Saarbrücken earlier) had been consumed so I’ll have to hope EC57 isn’t too wedged. Being international, who knows. As another ‘possible’ we used the new Rhein bridge between Ludwigshafen and Mannheim - think this may not have been in use last time. Left hand rearward facing non-smoker was secured on ICE876 (it reverses at Frankfurt) so it just remains to be seen if we go the right way. Should have noted that EC57, behind 181203, was 30 seconds late at Mannheim - 876 was 5 late leaving due to connection from 518. Into Frankfurt via the Sportfeld - Louisa curve - quite possibly done already but not marked on the map as done recently (nor on Ball, so maybe it’s another bonus). Departure from Frankfurt Hbf was 9 late at 15:22 with things looking OK so far as we headed over the nearer bridge to Stresemannallee and points east. An extra stop was included at Hanau just to let me fret for a bit longer, but in due course we set off for Kahl. By now the train was full and standing - the person opposite me had spread belongings on the adjacent seat, despite a half empty luggage rack. Antisocial, even by my standards. After the long trundle from Aschaffenburg all went to plan, with a suitable lurch to the left just after Langenprozellen. Round the Gemünden avoider and over the Burgsinn connection (again) to gain the NBS to Fulda. At the time of writing we’ve got about 7 minutes to do over 50 km but hey, the track got done! Connection should be OK but there was a long announcement about it at Frankfurt so I’ll wait and see. Only 8 late at Fulda so quite a good sprint of the order of 140 mph from Burgsinn. Onward connection to Eisenach (ICE 1503) arrived early as it was starting from Fulda vice Frankfurt Hbf during the engineering. ‘Twas almost empty leaving Fulda. A few minutes late at Eisenach but nothing to worry about. It’s pleasing to see that Eisenach has finally woken up to its significant role in history with small sticky notices under the station signs ‘Geburtsstadt Johann Sebastian Bachs’. Considering how Stratford and Salzburg, inter alia, pile it on, you’d think Eisenach might try harder. [What with the bloke being a towering genius, and all]. 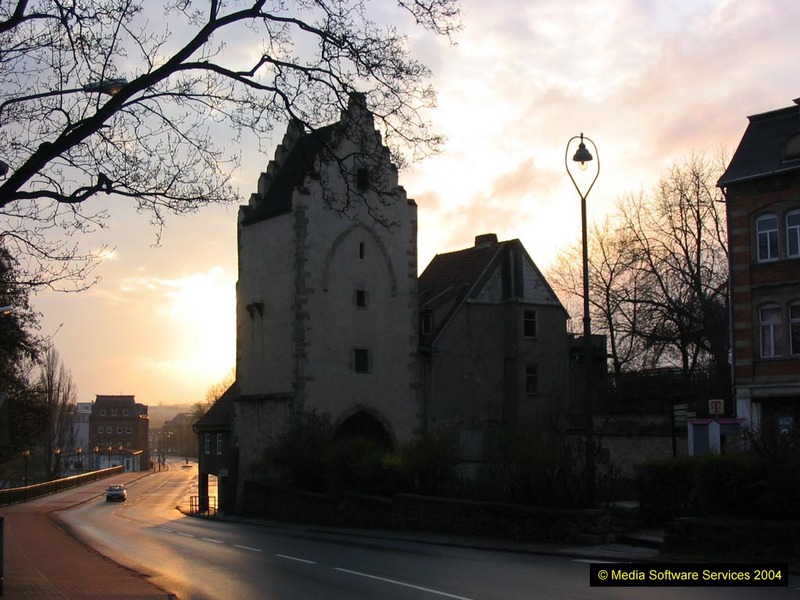 The STB kart to Meiningen was a SULFA of the mullioned windows variety. Nice seats though. It smelled horrible - hope tomorrow morning’s is a different one! The Hotel Am Kaiserpark had a very scary tunnel leading to it under the railway but once found I was made welcome (in German only, but that’s my problem not theirs). Breakfast looks a runner for tomorrow which was excellent news, and the scrounging of a map revealed a shorter and more appetising route into town. ‘Start at the cathedral’ worked as usual, the Ratsstübe being nearby and just the right sort of thing. A pepper steak and two Meininger Pils were had. The ‘very old’ panelling seemed a bit too good to be true, but certainly very convincing, and it had a nice atmosphere. Strolling back through the darkened streets of Meiningen I was surprised to be approached by two attractive young ladies - but they were lost and wanted to know where the cinema was! At least I haven’t been travel surveyed this trip - yet. 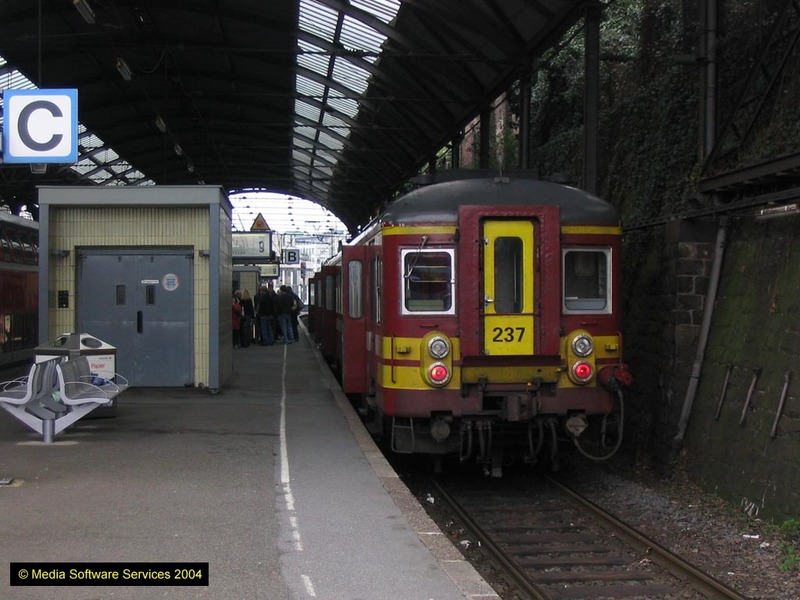 An assortment of 212s including 212 302, at Dillingen(Saar) 9.4.04. Alas the special to Bouzonville was a cart. Good night’s sleep, interrupted only by the bread delivery to the Pennymarkt opposite, at 0350. Even this was a benefit as I was in pain due to the cold draught and closing the window cured all! Bill paid at 0720 (€45, very reasonable) and I had my ‘towel on the chair’ before the German guests for breakfast at 0728. Only just, though. As good a breakfast as I’ve seen anywhere, fresh fruit, smoked salmon and all. Still not a word of English but as friendly as you like and thoroughly recommendable. Off to the station for the 0814/7/20 kart to Sonneberg (depends whose timetable you believe). It sat down at Grimmenthal for several minutes anyway, so what difference. Being STB it was another Adtranz mullioned window SULFA. Wretched thing, despite the comfortable seats; at least you could see out of the windows of Ferkeltaxis. Scary grippeuse descended just after G/thal and insisted on composting my SWT - goodness knows why as it’s marked ‘valid only on 10.4.04’ but no matter. It’s a pleasant ride to Eisfeld (where the sun had appeared) but thereafter most impressive, with a long horseshoe curve making the descent from the valley side into Bachfeld. At Ramenstein a new ‘basic’ station has been built about 100 metres south of the old one, whose station building remains. It has two platforms and, rather surprisingly, a scissors crossover connecting the two platforms to the Sonneberg and Eisfeld lines. The two diverge immediately, Sonneberg down and Eisfeld up. Track disappears beyond the old station but I couldn’t see where to (or why). Sonneberg Hbf was a bit disappointing in that Coburg trains have to use PP3/4/5 as 1 and 2 aren’t electrified. My kart came in on P2 and the one to Neuhaus is booked out from P1. Overlap, but no physical connections! Loads more scenery as soon as you leave Sonneberg for Neuhaus. The fire service at Hüttengrund is brewery sponsored - no chance of the Old Dun Cow catching fire there, then. There has been expensive engineering and station renewal on this section, just as on the Eisfeld line. Clearly the state is committed to its public transport, just like at home. Not. It was interesting to note yesterday just how superior a 12 (at least) year old ICE was to a Voyager, and presumably a Pendo. But I digress. 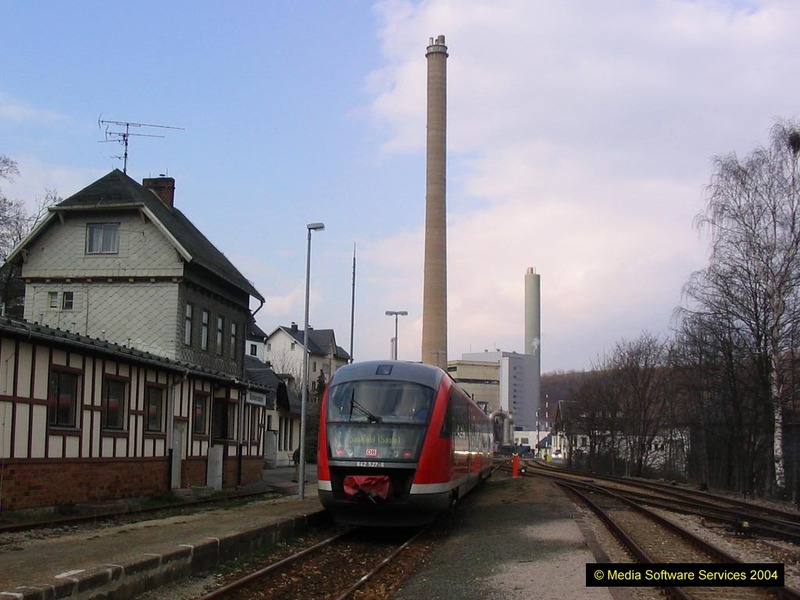 A new station has appeared at Steinach Süd, in an industrial/commercial area of the town. Steinach itself is squashed into a narrow valley and is consequently long and thin! 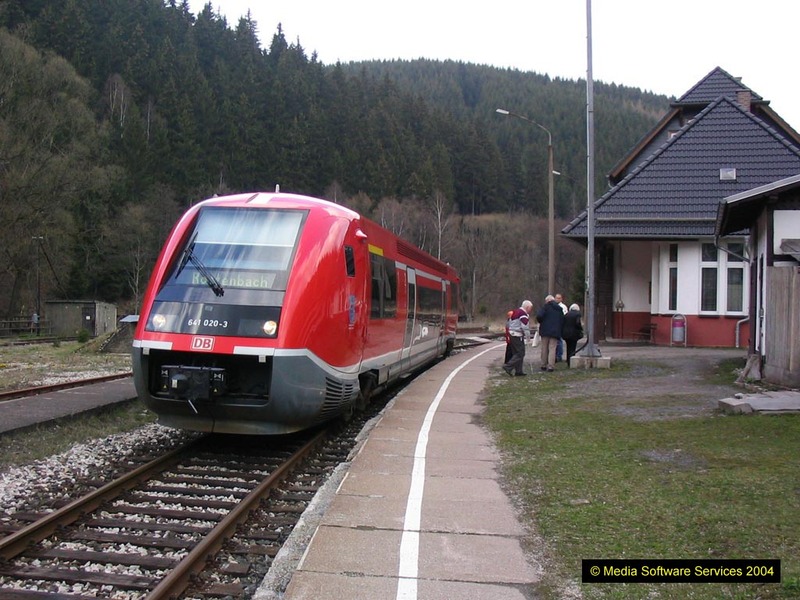 Lauscha is situated in an even narrower valley and has always been a terminus, with the station building next to the buffer stops. After reversal there’s a long steep climb out of the valley, through Lauschenstein tunnel and over a brand new concrete viaduct. Quite a lot of snow was evident around Oberlauscha. A further reversal occurs at Ernstthal which is in quite open country. I’d assumed this to be the top of the hill but no, it goes on up. It does look like the top of the hill going towards Probstzella - track disappears round a bend in that direction. Neuhaus is indeed on top of the hill (must be around 800m since everything else around here is, and I couldn’t see anything higher than where I was). Everywhere is down from the station, and it took me 45 minutes to find the pub, which is in Sonnebergerstrasse, about 10 minutes from the station (turn right out of the station, second turn right, at crossroads). It sold EKU (Bavarian?) at €1.20/0.4l or just under UK price, and provided facilities of which I was somewhat in need, and which are otherwise lacking in Neuhaus! All the buildings in Neuhaus am Rennweg are new - surely even the ‘Merkins couldn’t have bombed it, and given the very large blocks of (fortunately low rise) flats, the likelihood seems to be that it’s a DDR town building exercise. Why? No idea. Back on the railway, there’s a Meiningen snow plough stabled there. If you need a snow plough to clear the line, how do you get the loco there to push it? One of life’s little mysteries. 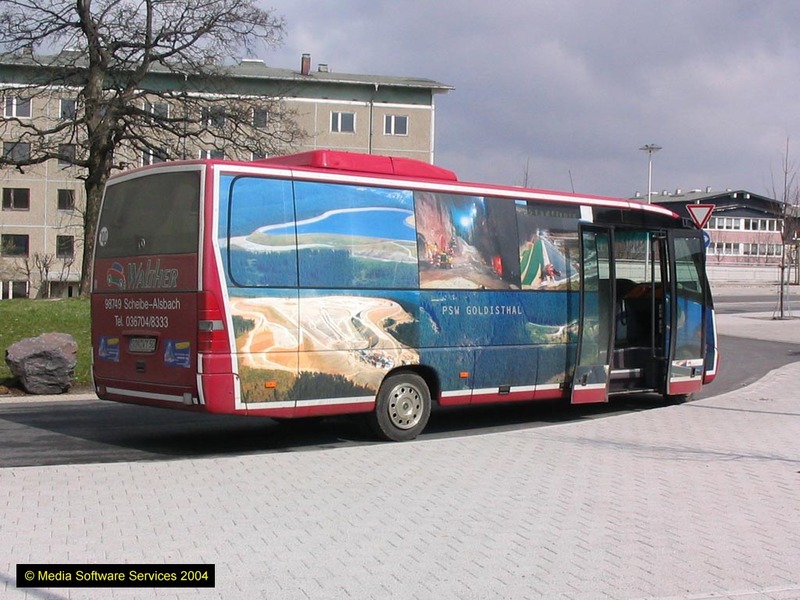 Next stage was the 501 bus to Katzhütte which is parked in front of me as I write. 30 minutes on it - thank heavens for the pub. It turned out not so good! It was supposed to be a 502 going to Katzhütte station and arriving 10 minutes before the train left. In fact it was a 501 and only went as far as Katzhütte Markt, leaving me a kilometre or so to walk. I missed the train by 4 minutes (heard it go) but having said that it was an amazing bus ride over some seriously mountainous roads. Neuhaus may be at 2600’ but Katzhütte most certainly isn’t! As luck would have it I’d called at ‘Norma’ in Neuhaus and purchased, for no less than €0.31, half a litre of Fürst from the Lobkowicky Pivovar, somewhere as yet undeduced in the Czech Republic [In 2018 the answer is to be found at the brewery's web site]. There was nothing for it but to sit in the sun for a while drinking Czech beer, which was hell, obviously. 4.8% abv and really quite pleasant, especially at 36p/pint. The train turned up after 20 minutes - a class 641 SULFA but nice and warm now the sun’s gone in. It (the sun) soon returned and made for a very pleasant run down the Schwarza valley. A large crowd of happy campers was apparent at Obstfelderschmiede where the temptation to get out and have a Thüringer and a beer, if not a ride up the funicular as well, was narrowly resisted. No rebuilding of stations has taken place on the reopened portion and from my seat on the train it wasn’t apparent why the line had closed. Down to Rottenbach then, for a 641 to Saalfeld where street plans seem to be a rarity. I’ll have to find out where the hotel is later. Another 641 made the long climb up the Saale valley (and others) to the reversal at Würzbach and upwards again to the summit at Heinersdorf. It’s well wooded almost all the way - after Heinersdorf there’s some interesting geology and then the countryside opens out as the line drops to Unterlemnitz. The S&W map’s a bit misleading here - the Blankenstein line in fact goes straight through with the closed line from Triptis trailing in from the north (left), the station building being in between the two lines. We crossed another train here and the lucky grippeuse got to go back to Saalfeld early! 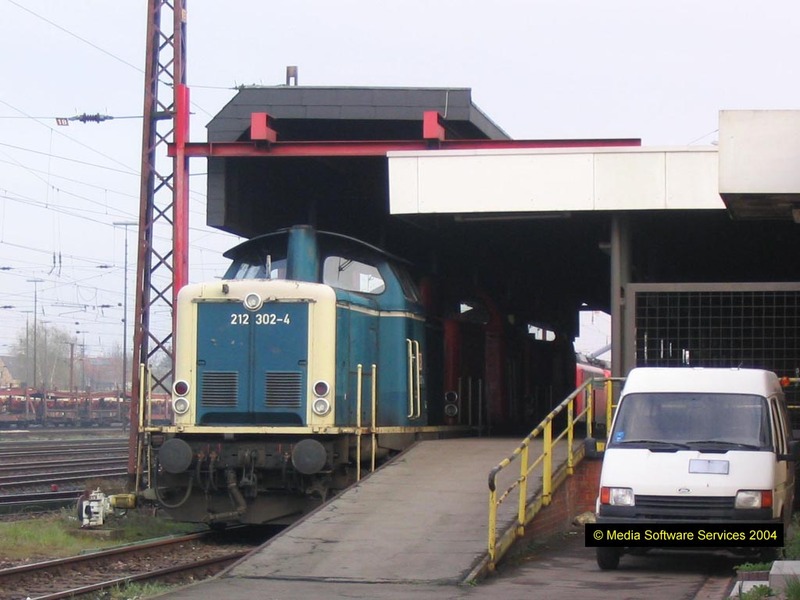 Semaphore signalling prevails at Unterlemnitz. The Triptis line is in place and shiny as far as you can see from a passing train, so more info is needed. There appears to be traffic to the timber mill on the outskirts of Lobenstein. Although speed is low there’s a new (or much repaired) viaduct between Lobenstein (which is quite large, with hotels etc.) and Harra. It’s back into the woods before Harra Nord, and the Saale reappears on the left before Harra having gone the long way round the hills (or in fact prior to doing so, as we’re heading upstream). A large paper mill occupies at least half a mile before Blankenstein and it must be said I was expecting desolation, Prachovice style (see June 2003). However. On arrival at Blankenstein (1715, dep 1841) there was a settlement of sorts, so after checking the yellow sheet I set off to explore. Down towards the Saale - first Gaststätte shut, practising for tomorrow and Monday. Second gaststätte ditto. Found two banks, one with a machine. 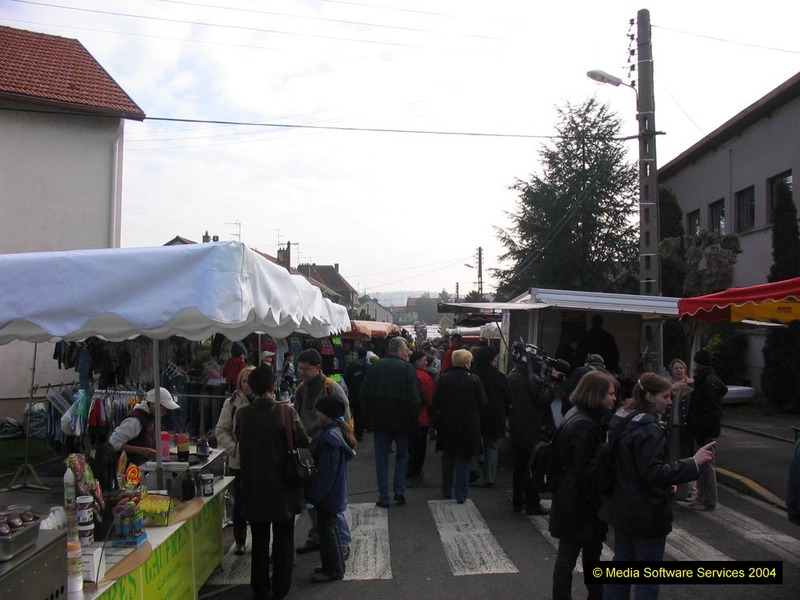 On to the Saale - a supermarkety thing, shut, then the end of town. Also the start of the Rennsteig, a 100 mile footpath ending near Eisenach, which must be a world class walk and then some. There were several parish notice boards around, extolling all sorts of places you’d like to be, none of which were Blankenstein. Having reached a sign marking the beginning of the Rennsteig (Prestatyn, Sedbury Cliff, where are you now?) I turned back and encountered another sign suggesting there might be a pub above the station. Imagine how quickly I raced up the hill, as fast as my rucksack could carry me, and eventually I found a pub which wasn’t actually boarded up. In I went, to find a wondrously hospitable four ale bar with one ale, Mönchshof from Kulmbach. Very limited English was spoken but the gaffer, whose 43rd birthday it was and whose son lives near the Angel Tube station, couldn’t have been more affable. His Mum, ex-primary school teacher, had forgotten almost all of her English (and Russian) but we pottered along happily through two Mönchshofen and a Jägermeister which the gaffer insisted on as it was his birthday. Well, it would have been churlish to refuse… He followed this up with a gift of a 20 mark note from 1914 which he insisted I took, and left me feeling somewhat overwhelmed! Value irrespective, what a wonderful thing. Never mind the track, it’s all worth it for this kind of hour. I was sufficiently composed on the return to note there isn’t (and wasn’t) a third side at Unterlemnitz, so previous notes are correct (you could interpret S&W as saying there is a very short length of the Triptis line in use, to be fair). Same platform/crossover at Würzbach on the way back, but no problem as physical connection couldn’t fail on the same train! Rather surprisingly I stayed awake all the way back and was able to note the (quarry I assume) loading hoppers at Lichtentanne which have a wagon traverser at the uphill end. Back at Saalfeld the Hotel Tanne proved to be only a few hundred metres in the rain, fortunately. Nice enough, but no English and the blinds didn’t work. Shame about the flats opposite - still, it’s not my problem! Off in search of a meal and I managed to pick the only pub in town not to sell Saalfelder (even though it said it did). Still, it sells Würzburger Hofbräu and they’re all much of a muchness until you get into unfiltered-land. The meal was horrendous - I hadn’t clocked the melted cheese which was over everything! Reasonably cheap though, and the chips were bostin’. Enthusiasm for a pre-breakfast trip to Großheringen had died by 2200 so I decided to stick to plan, and retired to bed. Still the same room as the hotel had a coach party of grockles from Uelzen - come to see how the other half lives perhaps. In fairness what I could see of Saalfeld in the dark suggested it’s a very handsome old town, and if I wake early I’ll trot round with the camera. Meanwhile, back to business, arriving at the station at 0720. No hope of going via Großheringen today despite all sorts of queries on the ticket machine, but I did turn up the 0820 RE to Gera which will get me to Cheb earlier, by way of Hof and Marktredwitz. The 0820 was a 642; big windows but little else to commend it. The service seems to be Leipzig - Gera - Saalfeld - Blankenstein and I was a bit thrown by passing a 642 at Triptis with ‘Blankenstein’ on the front having just looked at the rusty branch complete with stop board! Changed at Gera Hbf, which is ‘im bau’ in a big way with all the platforms under the overall roof o.o.u. and a temporary one on what I seem to remember were the through lines. Travel centre was working well though and I made reservations for the Naumburg - FFM IC for tomorrow (probably a good move as there were only compartments available) and the FFM - Oberhausen ICE for Tuesday (ditto, for 0700 on a weekday). Onwards in the first of two 612s to Werdau, a station so dull I can’t even remember if I’ve been stuck there for 34 minutes before! The Crimmitschau force field managed a couple of TSRs but is obviously much reduced in strength as we were but 1 minute late at Werdau. The same applied to the 1130 to Hof, three 612s. I got stuck in a smoker. Harrumph. Slightly surreal moment just after Reichenbach as the 612s hurtled on to a high viaduct at full tilt (in both senses) and as my coach rolled back to vertical a balloon, with enclosed gondola, passed by in the other direction. And higher up, obviously. Major goings on at Plauen ob.bf. with all track removed on the west side for a major bridge rebuild and the whole place pretty untidy. Part of the Dresden/Leipzig - Hof Ausbaustrecke it said, whatever that may mean. [Google says ‘developed road’ but I guess ‘track improvement’ or ‘route improvement’ is nearer the mark]. Passed 50 3616 on a northbound Kettlex at (I think) Syrau - the kart is being hurled along at such a pace that I can’t read the km markers. In its defence I have to say it’s quite comfortable and not causing any sickness despite the accursed smokers. But it did in the end, and I wasn’t feeling too special by Hof. Nipped across to P6A for the onward connection to Marktredwitz, another Nauseazüg, and picked a non-smoker. Soon after leaving, two persons opposite, having waited until the gripper disappeared, lit up. This was too much and a one-man riot ensued. They stopped. At Marktredwitz I was about to purchase refreshments, then realised that Czech prices were 20 minutes away. Seemed worth waiting! Czech immigration was done in the doorway of the kart at Cheb - rather more low key than my last visit. German variety was on train and thorough, with one being hauled off at Schirnding. At Cheb I scoured the town for somewhere that wouldn’t give me food poisoning but having dallied to buy timetables, which took a while with no German or English spoken, I hadn’t enough left myself enough time so settled for a couple of Regents at 25p in the left hand station buffet. Each, mind you. Inevitably, 1506 to Hranice v Čechách was a wheelie bin - 810548 for the sake of posterity. In the meantime I’d realised I’d forgotten the timetable supplements and nipped back for those, which were provided with good grace, if not even amusement. I’d venture to guess not many non-Czech speakers come rushing back waving the supplement coupon! Off to Hranice in the wheelie bin. The layout after Františkovy Lázně is not quite as S&W 2000 would have you believe. There are two tracks from FL to FL-Seniky, both have OHLE but the crossover just north of FL-S, where the OHLE ends on the Hranice line, has been disconnected. Safe to assume therefore that the two operate as single lines and that electrics only go towards Bad Brambach. The rest of the branch is typical North Bohemia - steep gradients, constant and severe curvature, and very nice to look at. There’s a lot of timber traffic at Aš which has a yard below the level of the branch. Just after Studánka an unofficial stop was made to drop off a family of four at the end of their drive, then on to a rather run down terminus at Hranice (the line used to go through to Adorf but buffers are now in place. 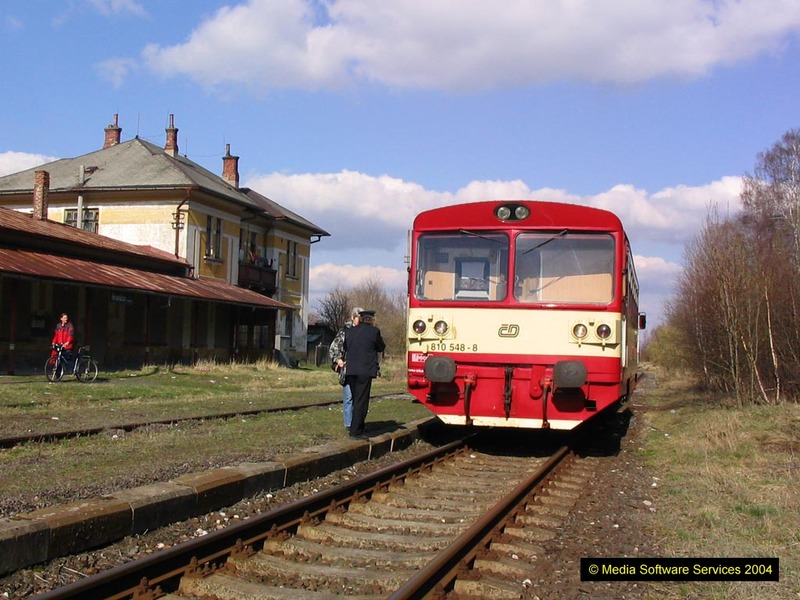 Arrival at, and departure from Hranice were 3 or 4 minutes late but given the pathing stops, the general downhillness on the way back and the 31 minute connection at Cheb that’s not an issue, barring unforeseen circs. 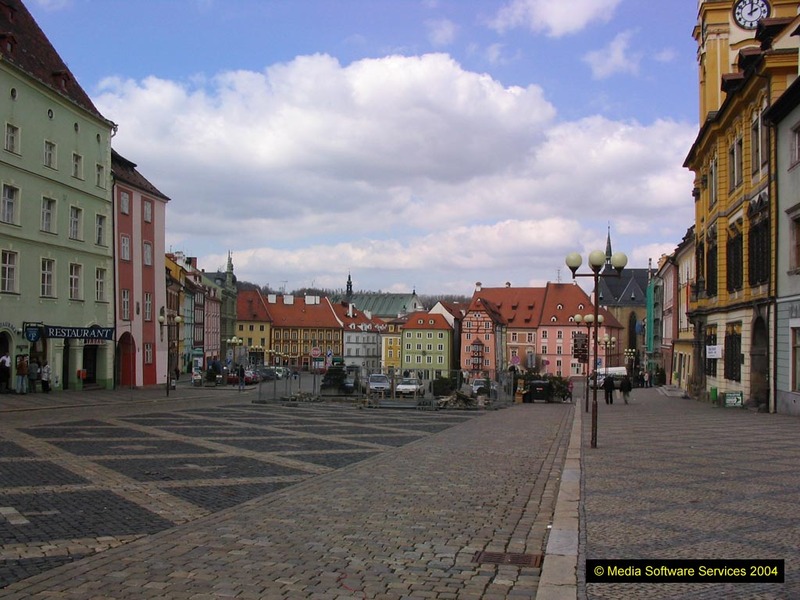 Around 6 made the journey through to Hranice, most leaving at Aš Mesto; one returned from Hranice (besides me) but 13 more joined at Aš Mesto. The physical junction between the two single lines appears to be at km 67.3 immediately north of Františkovy Lázně. 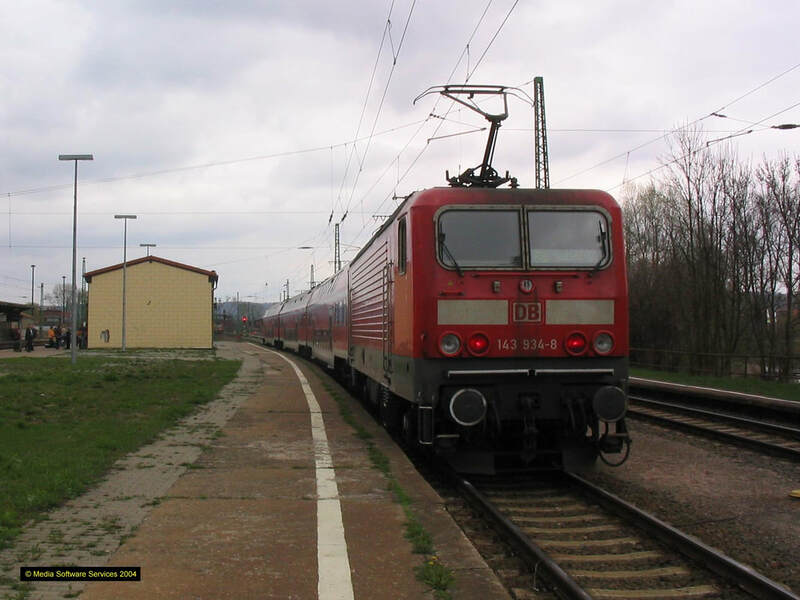 Noted by chance at Cheb that line 143, Chodov to Nová Role, has one train a day, running in darkness (train 17113, Johanngeorgenstadt - KVdn, dep Nová Role 2152, arr Chodov 2204). After this revelation, I had to retire to the ‘Bufet’ for a Gambrinus. This typically awesome establishment was unchanged since (at the very least) the 1960s. Vinyl chairs, painted steel bar (flaking, obviously), galvanised steel cooker hood, you name it. And the tannoy announcements echoing constantly… CZK 14 for the Gambrinus. Back on the Vogtlandbahn kart the immigration man came round, typed me into his computer and to my great delight stamped my passport! A fitting end (rather sadly) to my last visit to the Czech Republic as a proper country. Last desperate attempt to get some nosh at Marktredwitz. Easter Sunday, 1900? In your dreams. There was a McD on the edge of town but the centre had its head down practising to make my life difficult tomorrow. As luck would have it I did find a pub open (it was so surprised, it had had to put a sign out) but with 10 minutes to spare, no chance. And so it was another Vogtlandbahn ALFA to Weiden. Hope the hotel’s open. Half way to the hotel, the most welcome sign I could hope for (today) - Golden Arches! I decided to take on fuel on a bird/bush basis, only to find when I got to the hotel, which was open/English speaking/expecting me/very nice, that the restaurant was still open. Ah well, the McD was cheap. 810 548 at Hranice v Čechách 11.4.04. The line used to continue beyond the railcar, to Adorf. Yet another ‘maybe I’ll do the Großheringen curve today’ day. Alarm woke me at 0615 (works better when switched on!) and I pottered off to the station at 0700 to find it all locked up. Finding my way to the platform there turned out to be a fine, and open, supermarket/bakers shop/caff where coffee was obtained. All the rolls had mayo, alas. Next try, Bayreuth. Still, it was a nice warm spot to wait for the 628 to Bayreuth via Kirchenlaibach. This goes through very flat countryside, but with a few hills in the background and on a cloudless morning it looked pretty good. An on-time arrival gave me a whole hour not to find any mayo-free breakfast but also to note a promising number of pubs and economical looking hotels very near the station. Possibly a good place to stay as I’ll have to return at some point to do the line from Nürnberg in daylight. The IC to Hof was a pair of 612s in IC livery. Internally the difference from the RE ones is a token blue IC antimacassar on each seat. Hm. Lots of broken diesel ICEs at Hof - perhaps they’ll be back one day. Anyway, the IC did the business for me, rounding the Neuenmarkt-Wirsberg avoider on its right hand doorhandles (well, a few degrees of tilt anyway) and accelerating hard! The driver didn’t seem to be pushing that hard most of the time, but 47 minutes for 75 km suggested near enough 60 mph average over a very twisty route, and the train was 1 minute early at Hof. 27 minutes for 49 km Hof to Plauen might be more lively - it certainly was yesterday. The Neumark - Greiz line was noted disconnected at the Neumark end. Score one to Mr. EG. Onwards to Zwickau, where the Zentrum branch provided very good value. 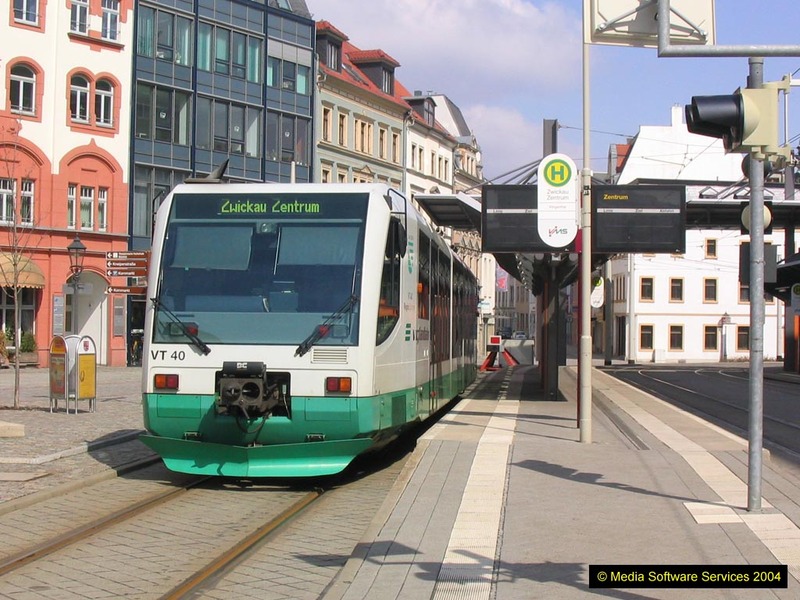 It leaves the Aue line as a ‘proper’ formerly freight branch, joining the metre gauge tram lines kust before Zwickau Glück Auf Center. It has a separate platform there at ZGAC; thereafter it becomes mixed gauge on a reserved alignment along Aussere Schneeberger Strasse with the standard gauge diverging as it crosses the ring road, to terminate in its own platform alongside the trams in Innere Schneeberger Strasse. The only point at which the DMUs can mix with the road traffic other than at crossroads is a stretch of 20 or 30 metres at the end of Innere Schneeberger Strasse where it crosses the ring road. The rail vehicles are the original Vogtlandbahn RegioSprinters with deflectors front and rear - there are valances between the wheels but I think these are original. The main line junction is at km 37.4, 600 metres from Z-Hbf. Back at Z-Hbf I had to give in to the mayo, it being almost 12:30! It wasn’t that bad. Or maybe I was that hungry. Hasseröder was purchased to while away the ride to Göschwitz on yet another 612 working RE3680 to Göttingen. The Crimmitschau Force Field worked its usual magic, converting a 1 minute deficit at Werdau to a 3 minute one at Gößnitz. 14 minute stop here, maybe in recognition by the timetable planners that there is a kink in the time-space continuum at Crimmitschau. After all the excitement of the Großheringen curve, it was back to normality on a Halle-bound RB to pick up the IC to Frankfurt. Naumburg seems to have lost enthusiasm for its rebuild - three out of five platform faces and two out of three canopies, but the rest is pretty down at heel with the local boozers occupying the booking hall (for which you can’t really blame them - on a bank holiday it was probably the only place this end of town open to sell beer). Both the eastbound RB and the westbound IC, headed by 120158, were on time. Approaching Fulda, lots of announcements of diversion and delay. On leaving we took the classic line towards Gelnhausen as booked, but then turned left at Flieder on to the old route to Gemünden, which as far as Sterbfritz is seriously slow. We went (eventually) round the Gemünden avoider, after passing a top and tailed northbound IC. The DVT was at the front and the rear loco appeared to be powering, so goodness knows what that was about. When you boil it all down I could have gone via Osterburken on Friday and done a lot more track, but IC2650’s timings for today clearly indicated normal route. We’ll certainly be hideously late in FFM on published timings. And so to Frankfurt, e..v..e..n..t..u..a..l..l..y. 35 minutes late according to the arrival indicator (still insisting we weren’t being diverted) after signal checks before Hanau and again after Frankfurt Süd. Felt sorry for those going on to Karlsruhe. A quick fuel stop and then over the road to the Inter-City, the usual ‘up itself’ Travel Inn. Handy though, and the HRS rate made it pretty good for Frankfurt. 0530-ish start for a comprehensive breakfast and back over the road for the 0700 ICE 222 to Köln - er, no, it’s 0706 and they’ve just announced a signal failure. And now we’re off, still 0706! Out from P21 via Niederradbrücke, not that it makes any difference. No British style ‘if we’re late we’re late, blame DB Netz’ - vigorous acceleration from Sportfeld into the tunnel (could be new track from here as far as the junction with the Gross Gerau line). 4 late from FFM-Flughafen with a 191 kph schedule to Köln… Noticed a 218 as we hurtled through Montabaur. ThunderRabbits are Go!!! Gripper came round shortly thereafter (no attempted ching despite Internet rumour) at which point the display showed 302 kph. At that rate, 191 average looks a bit pedestrian. The first 177 km to a signal stop took about 36 minutes. This was near Porz - a very slow run into Köln then via the old freight route from Porz - Südbrücke - Bonntor - Köln Süd to K-Hbf where we arrived at 0813, 2 minutes early. Piece of cake. Out of Köln via rightmost lines through Deutz, under Troisdorf lines, centre pair through K-Buchhorst and K-Mülheim, under S-Bahn and freight lines, via northernmost single line on to fasts to Düsseldorf. Rightmost (more or less) tracks all the way to D-Hbf using P17 thereat (and a minute late into the bargain). Back to ICE-style reality at Duisburg with an early arrival and on time departure. Rightmost track (and platform) throughout. Somehow a couple of minutes got lost to Oberhausen but it didn’t cause a problem and I had time to phot an ICE and one of PEG’s SULFAs (now sporting red white and blue instead of the blue and puce on their Ferkeltaxis) before pottering off to Mülheim (Ruhr) Hbf on an S3 to do, I believe, my last Ruhr passenger track give or take a few hundred flyovers. The next thing out of Mülheim seemed to be a good thing and turned out to be the 0938 RE to Duisburg and Düsseldorf Hbf, connecting easily with 1020 Düsseldorf - Monchengladbach - Aachen RE. A real trudge on the RE, losing bits of time all over and finally grinding to a halt for no given reason just before Erkelenz. It left there 9 late but some mild recovery then set in with the deficit down to 5 by Aachen West and around 3 at Aachen Hbf. A farewell Thüringer was taken here, but I decided to give the beer a miss even though it was after 12 by the time I’d finished photting. For the snappily branded EuregioAIXpress (what??) I’d expected at the least a gaudily liveried ALFA. 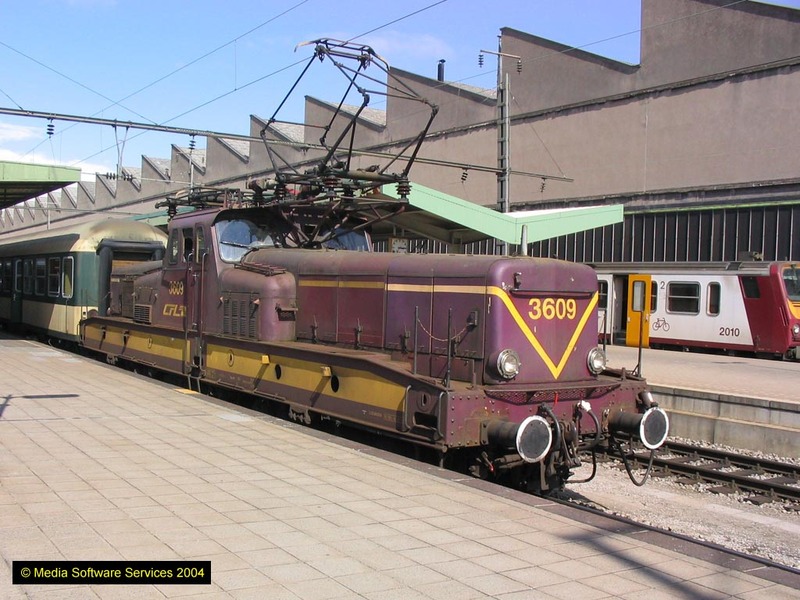 Should have known - the Belgians turned out a horrible old 2 car EMU with vinyl seats (237, for the record). And this is an RE? Mind you, Luxembourg’s as bad. I have to note that the toilet was right up to the exceptionally high standards traditionally observed in Belgian pubs (pace In de Vrede and a few others). On to Liège Guillemins which looks as if a deliberate attempt has been made to destroy it! It seems to be moving a few hundred metres east, but at the moment bare platforms, the odd canopy and the horrible old buildings is about it. Fortunately only 30 minutes to wait for a near empty, air con set which duly did the new line from Ans to Leuven. Leuven has also had a major upheaval but now has a spanking new ‘futuristic’ overall roof and from a passing train seat at least, it looks the business. [Pity in a way. Unlike Liège I rather liked the old one!] I wonder what happened to the excellent beer and sandwich stand-ups on the platform. [Now you know why…] The new line parallels the motorway for most of the way and is predictably dull. The 13 was leaving the traffic behind but not all that rapidly, and I suspect 160k-ish is top speed. They are mixed traffic locos, after all. Nevertheless, early at Leuven and Brussel Noord. Between these two, chaos reigns. The middle two roads aren’t there, all trains currently using the outer two. The middle two are physically in place from Zaventem inwards, but appear to be dedicated to the engineers. The Diegem curves are in place but disconnected, whether to be reinstated I know not. I didn’t see the airport connection. Baled out at B-Centraal, wandered about, decided I was fed up with high process and off hand service at Toon and Cirio and trotted off back to Midi and Le Laboreur, where I was received courteously and sold a Westmalle Tripel at (slightly) less outrageous price. Jolly nice too, paprika crisps and all. After purchasing emergency supplies and a wait for the cash machine (fruitless - too long a queue), made the E* checkin with a whole 2 minutes to spare. There were hardly a coachful, let alone a trainful, and as I write this at 1659 (departs 1701) I’m the only passenger in coach 14. And yes, I’m in the right seat. Perhaps the Mothers Union outing will get on at Lille. This one’s booked fast Lille - Waterloo so should be doing the flyover at Ashford, leaving just the London-bound connections to do. Good result. It did do the flyover, and it is a single alignment throughout with split alignments to/from Ashford each way so yes, it’s just the London-bound connections to do. Arrival at Waterloo was early, to the point that by the 1837 arrival time I’d reached Leicester Square on the Tube. I made Euston for the 1905 with ease and found it to be a Manchester bound HST routed via the Grand Junction throughout. It sat outside Northampton for 10 minutes ‘waiting for Silverlink to clear the platform’. All three were empty when we passed through. After a very slow crawl from Coventry to Stechford (CT local in front? They never are when I’m on them) we waited a further five minutes at Aston for an alleged signal failure. Over 20 minutes late at Stafford and the up Virgins were in such a mess that I rang Herself, who kindly came by car to rescue me from the Great British Travel Experience. Eurostar were less than busy from Brussels to Lille on 13.4.04. Even the coat is mine. The next month Mrs EG and I, together with a friend, set off on an 11-day 4-country marathon, starting and finishing in the Czech Republic.